The first quarter of the year saw audience and market share appreciation on strategic intervals for Intact Media Group’s TV Division, as a consequence of launching the spring grid. The group’s family of channels boosted their numbers during the Morning and Access slots, with the market share evolving by 2%, respectively 3%, vis-à-vis Q1 2017. On the urban target, the Antena channels led the audiences during Day Time and Access, while dominating the Access slot on the national level. During March, the Access slot grew its market share by 6% on the 18-49 target, compared to the same period of last year. 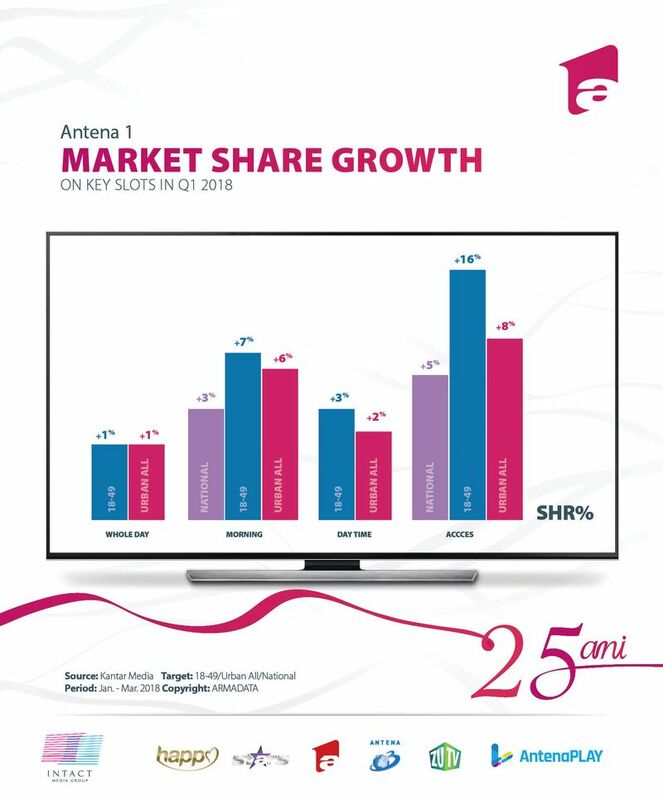 Antena 1, the flagship entertainment channel, home to the largest star system in Romania, showed market share and audience appreciation on key slots on the commercial target, during the first quarter of the year. In this regard, if the audience numbers grew in the Access slot by 17%, the market share consolidated during the morning interval by 7% during Day Time, by 3% during Access, and by 16% on the 18-49 target, compared to Q1 2017. Evolving market share numbers are also seen on the urban (+ 6% morning/ +2% daytime/ +8% Access) and national targets (+3% Morning/ +5% Access). At the same time, the market share consolidated during the whole day, on the commercial and urban targets. The March results contributed significantly at this consolidation. In terms of audience, the Day Time and Access slots grew by 11%, respectively 32% on the commercial target, compared to the same period last year. The market share followed the same trend, with higher numbers on all targets for the Day Time and Access slots. The most watched productions in March were the new episodes of “IUmor”(comedy show), the adventure race “Asia Express” (reality show), the local production“ Fructul oprit” (series) and the main news bulletin “Observator”. On the national target, the Monday to Friday, the Access production “Acces Direct” was the absolute leader of its slot (17-19), scoring 91% leadership. Antena 1 was reached in March, during the Whole Day, for at least one minute, by almost 8 million viewers, whilst www.A1.ro had 5.242.435 unique viewers. Antena Stars, the only TV channel in Romania dedicated to celebrities, was watched during March by almost 3 million viewers, on the national target, during Whole Day, for at least one minute. Antena Stars’ most popular productions last month were the newly launched “Stăpânii vedetelor”, a program dedicated to celebrity pets, “Refresh by Oana Turcu”, “Party like a Star” and “Star Matinal”. Happy Channel, the Group’s TV station addressed to women, was watched during March by more than 1,1 million viewers at the national level, for at least one minute, during Whole Day. The most popular series were “Elif”, “, “A doua șansă”( Kalbimdeki Deniz), “Inima orașului” ( BuSehir Arkandan Gelecek) and “Rădăcini”( Roots). 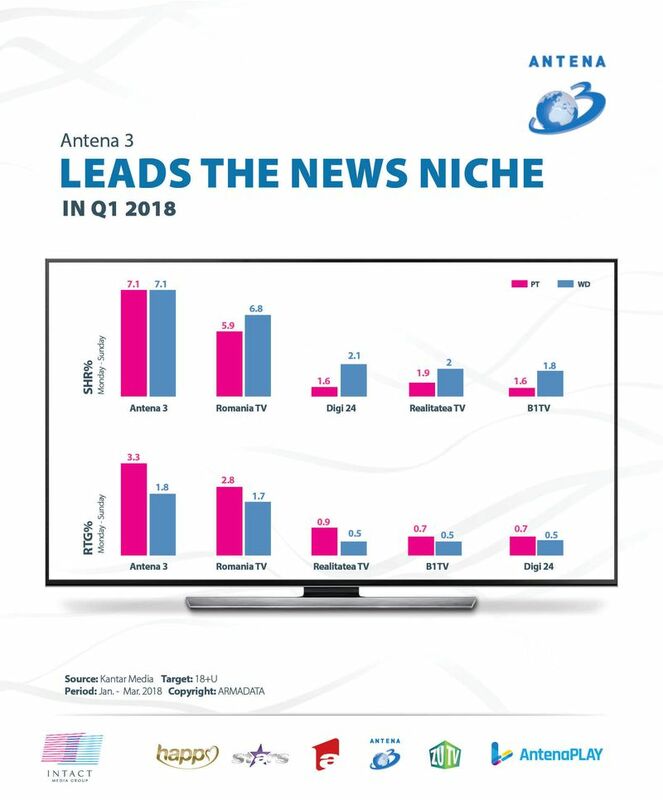 Antena 3 maintains its leadership of the news niche in the first quarter of the year. As such, the news channel led the primetime interval (19-24), as well as the whole day on the 18+Urban, All Urban and 25-54 Urban targets. 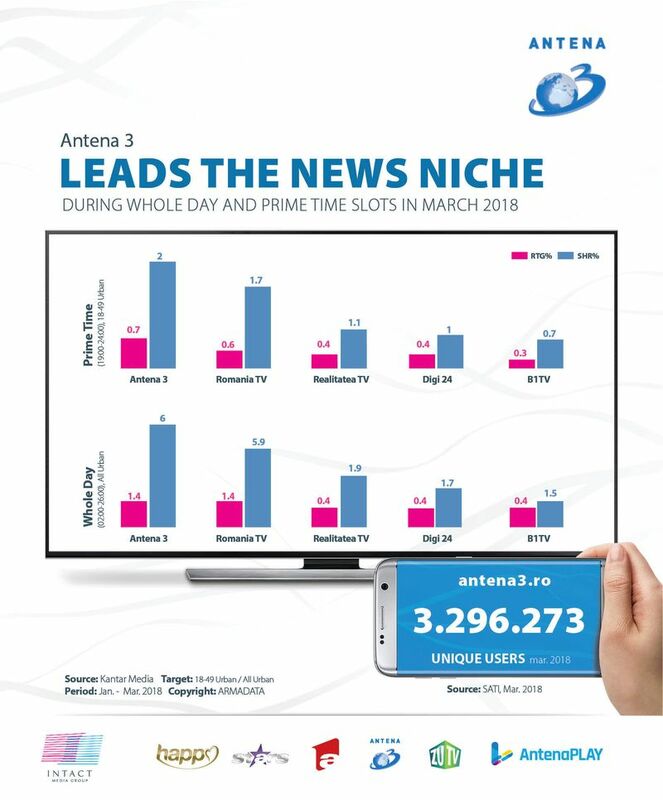 During March, Antena 3 was the absolute leader in the Prime Time slot on four targets (18+ Urban, Alll Urban, 18-49 Urban, 25-54 Urban), as well as during the Whole Day, on the 18+ Urban, All Urban and 25-54 Urban targets. The channel was watched almost 3,9 million viewers during the Whole Day, for at least one minute, in March. 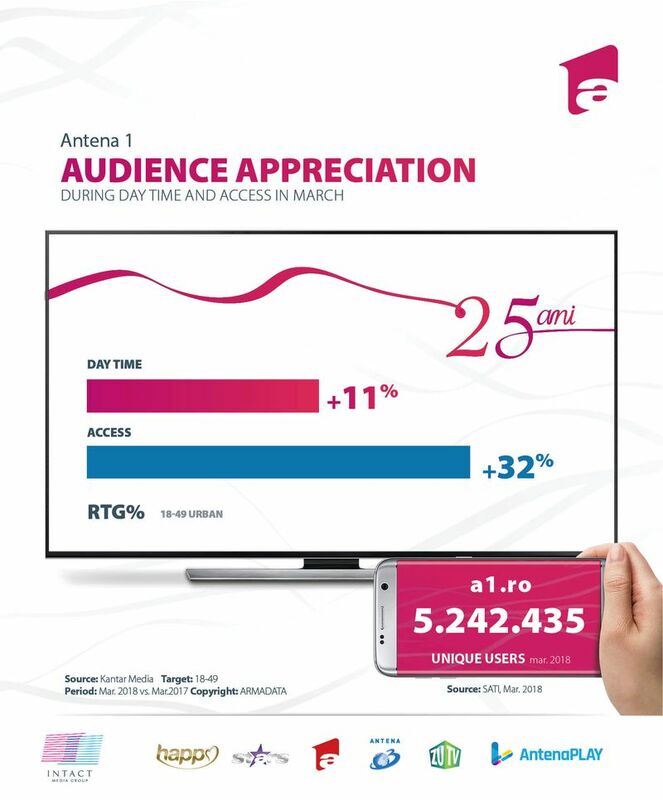 On the digital front, Antena3.ro had 3.296.273 unique viewers. The most popular programs were “ Voi cu Voicu”, “Adevăruri Ascunse”, Sinteza Zilei”, “În Premieră”. Moreover, Antena 3 had the biggest number of programs in the all news monthly chart, on the commercial target, with “În premieră cu Carmen Avram” as no.1. 9,8 million Romanians watched Intact’s productions during the Whole Day, for at least one minute, on national level, during the first quarter of 2018, while 7.2 million were reached during Prime Time.